Process mapping is far more than producing a bunch of fancy flow charts within the quality department to satisfy the auditors that you know what you are doing. Process mapping used correctly can drive some impressive savings in your business and very simply too. Process mapping has to be my favorite tool to use as a business consultant; I can quickly throw up on a wall a basic process map using different colour post it notes and have everyone buying into a common view of a process on which to build some changes. But just what is process mapping and how can we use it? 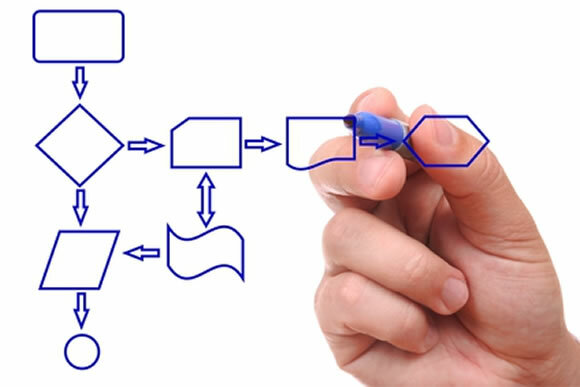 In its simplest form process mapping is producing a highly visual view of a process using standard shapes to define things such as decision points, documents, data entry and so forth so that you can have a clear understanding of how a process works. It can be performed at any level of detail such as using a “Value Stream Map” of the overall business down to a flow chart of a small operation within production or our offices. How can process mapping be of benefit? The simplest and most common use of process mapping is to provide the company with clear and easily understood procedural type documents for daily use and training. These simple flowcharts are easily understood compared with documents that are purely text and often can be produced much quicker. Typically a four or five page written procedure can be summarised easily into a single page flow chart which is far easier to understand and more likely to actually be read. However; only using process mapping to produce a few procedures is a huge waste of this very powerful technique. Process mapping can only provide improvement when you begin to question each and every step of said process. Most people start to look at a process and to think about how you perform the process and begin to consider if there are better ways to do it; but thinking about how you do something is often the last thing that you should consider. The first question you should ask of each and every step of your process map is “What are we doing and Why?” Often when it comes down to it we find that we are doing something for no very good reason; for instance many forms that people fill in could be auto-completed using data already within our computer systems or the data is no longer required or is just not used at all. So why do it at all? If we started this process by asking “how” what would we do? We would improve a process and get better at doing something that no one even needs! This is why “what are we doing and why?” has to be the first question so that we can eliminate the things that are just not needed and add no value. The next honest serving men are “Where” and “Who,” again combined with the very powerful “Why.” Why does X have to do it in their department? Could it not have remained with Y in their area if we provided them with the equipment, training and authority? “When” is our next question for our process questioning, “Why” do we do it at this stage of the process? Could it be done sooner or later, or in tandem with something else and would it be an improvement? Only when we have decided that something has to be done, who has to do it, where they will do it and when do we finally look at “how” we undertake the work. How effective can Process mapping be? I once led a team to map and improve a simple design change process; the process was taking up to 13 weeks and our target was to get this down to under two weeks. The final outcome of our mapping and process improvement exercise was to demonstrate the whole process to the management team from definition through to the delivery of all drawings, documentation and the product in just ONE HOUR. So stop only using process mapping to “write procedures” and unlock its real power to question your processes to drive some real improvements.